One my favorite authors over the past 5 years has been Bob Buford. I was first introduced to Mr. Buford's writing through his book Halftime: Moving from Success to Significance. In one of his latest books, Drucker & Me, Bob Buford tells the compelling story of an unlikely, 23-year friendship between the Austrian-born 'father of modern management' who loves Japanese-art, and a wealthy Texas cable TV operator and ardent Dallas Cowboys fan. Under-the-radar they organize meetings with an elite list of leaders to revolutionize the world of non-profit organizations. 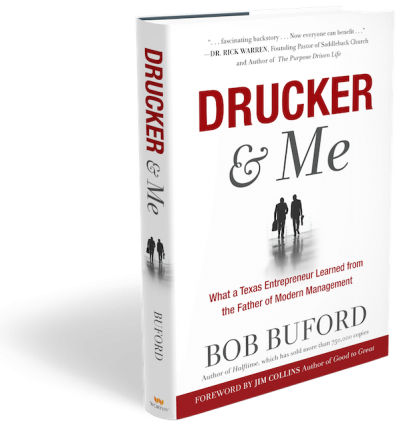 Drucker & Me tells how two men discover a mutual passion and strategy that will literally change the world. Their disappointment with corporate America leads them to embrace the non-profit sector, including one of the most important developments in the last 30 years—the mega church movement. Believing non-profit organizations change lives, they begin work with Rick Warren, Bill Hybels and others to design a new management model for non-profits in the 20th century.